At the end of January, Japanese Prime Minister Shinzo Abe paid a three-day visit to India, at a time when ties between Asia's top two economies were strained over a dispute over the Diaoyu islands in the East China Sea. India and Japan held their annual summit meeting, a tradition in place for over a decade and a mark of the India-Japan strategic and global partnership. Abe may be too eager to form an anti-China alliance. One year ago, Abe vowed to establish a "democratic security diamond" consisting of Australia, India, Japan and the US state of Hawaii, in an effort to contain China. Abe put in more efforts in his visit to India this time. He followed Emperor Akihito and Empress Michiko who visited India just one month ago. When Abe went there, he threw in a large sum of money to seek a number of agreements with India, including selling the US-2 amphibious aircraft to India, which violates Japan's "three principles" on arms exports. Japan does not hide its intention to compete with China in South Asia. With India looking for $1 trillion in investment for its infrastructure sector, Japan is being seen as a key partner. Japan is already involved in the construction of the Delhi-Mumbai Industrial Corridor, a mega infrastructure project of $90 billion, connecting India's political capital New Delhi with financial capital Mumbai. Now, Japan is ready to fund the second industrial corridor between Chennai and Bangalore in India, where China has been pushing forward the Bangladesh-China-India-Myanmar economic corridor which aims to boost economic cooperation between these countries. All these show that Japan is determined to counter China both militarily and economically. India has a complex relationship with China. 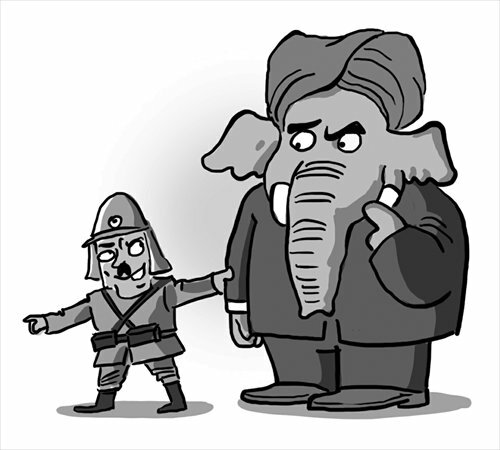 It is still wary over the 1962 border war fought between China and India, which is the biggest obstacle for the two Asian giants to overcome in moving closer. In August 2013, India accused China of stirring up trouble along the Line of Actual Control by deploying the PLA's border guards in a disputed land, while China urged India not to aggravate problems on the border. The dispute reinforced the sting in India's heart. It then increased military deployment at the border area and launched the Agni-V missile in a move that was said to be aimed at China. India, unlike China, is not a permanent member of the UN Security Council and is still bidding for such a status. During Abe's visit, India invited Japan to be part of the Malabar annual naval exercise with the US, which aims to contend with China over advantages in the Indian Ocean. Nonetheless, India is keeping a low profile in forming an alliance with Japan to counter China. India has always adopted a diplomacy that helps it gain interests from all sides. For instance, India used to have a good relationship with the Soviet Union, and after the Soviet collapse, India mainly imported weapons from Russia. But now, India is also seeking arms from the US and France which can offer it more favorable conditions than Russia. China and India share a lot of similarities and face the same challenges, such as tackling climate change and energy security cooperation. India can take offers from Japan or the US, but at least, the bottom line is that if the dispute between China and Japan evolves into military clashes, which is very unlikely, India will not back up Japan. China has showed a willingness to solve the border dispute with India. Chinese Special Representative for Border Problem between China and India and State Councilor Yang Jiechi talked with Indian Prime Minister Manmohan Singh in New Delhi last week about the issue. Striking a balance between all sides will test India's diplomacy.